Tornex Table Removes Cigarette Smoke With A Mini Tornado | OhGizmo! Way back in 2007 we brought you news of the Mercedes-Benz Museum’s 34 meter tall man-made tornado that was designed to quickly and effectively remove smoke from the building in the event of a fire, so as to protect the exhibits from smoke damage. The Tornex system is basically the same idea, though on a much smaller scale. It’s instead designed to deal with the smoke from deliberate man-made fires, cigarettes, using a series of perforated silver poles that all blow air in the same direction, creating a miniature vortex. The air is then drawn into a charcoal filter system which removes about 95% of the smoke and odor before it’s returned to the smoking area. The silver poles also serve to create an air curtain keeping the smoke inside a designated, though not necessarily enclosed, smoking area. The cost? 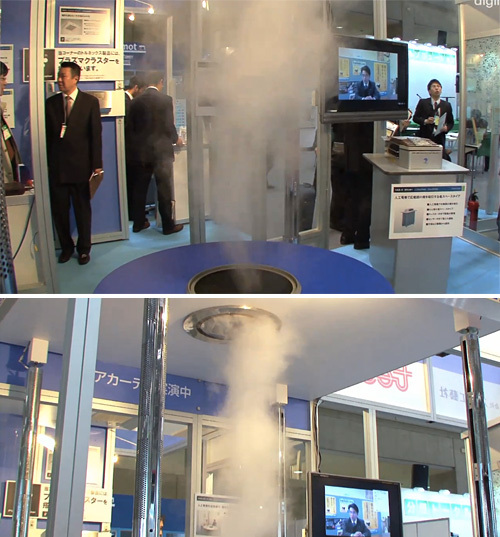 A totally reasonable $30,000+ (¥2,500,000) given the system makes freakin’ tornados! ← As I Predicted, That New Magnetic iPad Smart Cover Is Already Changing The World – Behold Magnetic Baby Clothes! They shouldnt be making something to help keep people smoking.